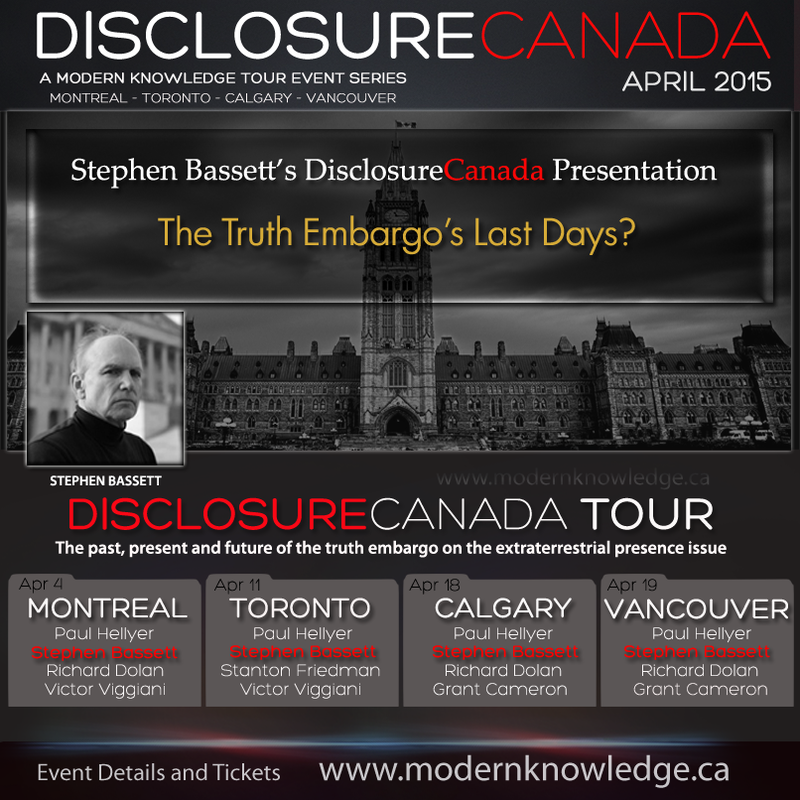 Stephen Bassett: The Truth Embargo's Last Days? Formal acknowledgement of the extraterrestrial presence engaging the human race is no longer a bridge too far. The challenge now for all who champion open, transparent government and the people's right to know is getting across that bridge before someone blows it up. It is a race against time and institutional bad behavior. Who will step up to win that race? Will other nations break ranks with the United States? How far will they go? What is the status of the Disclosure advocacy movement? What strategies are in play? Why can they work? Can Canadian activists duplicate these strategies? Should they? These questions and an update on the status of PRG's Congressional Hearing Initiative in Washington, DC will be covered. 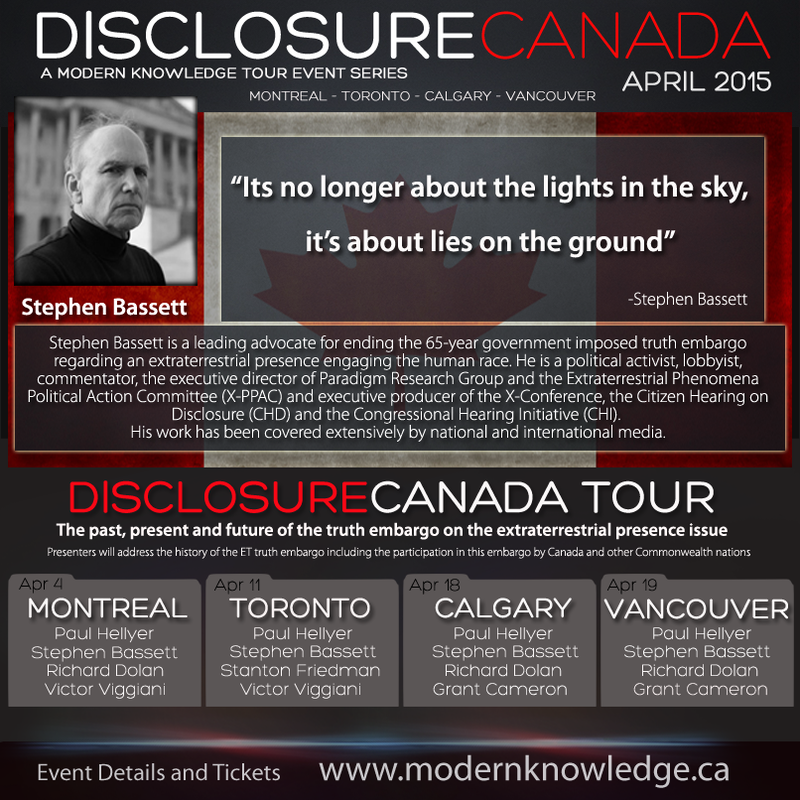 Stephen Bassett is a leading advocate for ending the 65-year government imposed truth embargo regarding an extraterrestrial presence engaging the human race. He is a political activist, lobbyist, commentator, the executive director of Paradigm Research Group and the Extraterrestrial Phenomena Political Action Committee (X-PPAC) and executive producer of the X-Conference, the Citizen Hearing on Disclosure (CHD) and the Congressional Hearing Initiative (CHI). His work has been covered extensivelyby national and international media. See PRG Media Coverage and CHD Media Coverage. On November 5, 2014 PRG launched the Congressional Hearing Initiative seeking hearings for the scores of military/agency/political witnesses ready to testify on Capitol Hill. On January 7, 2015 PRG will submit a sixth petition to the White House regarding the demand for congressional hearings. Concomitant with these projects is the continuing public awareness work via the PRG website and media appearances coupled with lobbying of the political media to take notice of what is easily the biggest and most important news story in history. With the nation and world moving into new and troubling territory, Mr. Bassett will continue to work to create a broad based coalition within the extraterrestrial phenomena research/activist community capable of reaching out to the twenty million plus American citizens who are following the politics of disclosure with interest and concern. The aim is to form a political awareness of sufficient size to meaningfully influence government policies and actions leading up to and following the formal acknowledgment of the extraterrestrial presence.